Phew! We got sweaty at Y7 Studio with a hot yoga class this week. DAVIDsTEA had a setup and was serving yummy tea to refresh us after we sweated buckets in a heated studio. Be sure to try their Serenity Now tea, it’s subtly sweet and calming, perfect post-workout. When I start feeling a little stuffy, I like to cut back on dairy, especially before a big run (like, you know, the marathon on Sunday, no big deal). 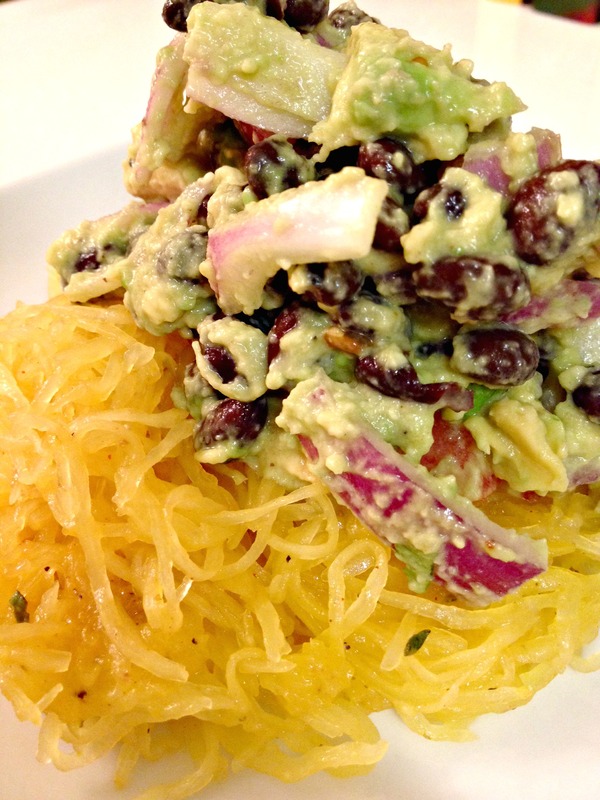 I decided a little spice wouldn’t hurt either, so I found this yummy recipe from Oh She Glows: Tex Mex Spaghetti Squash with Black Bean Guacamole. Holy yummers, it was delicious. And super, super easy. These pictures don’t really do it justice, but I was in such a hurry to chow down that I didn’t pause long to take them. Oops! Step 1: Preheat oven to 375F and line a large baking sheet with parchment paper. Slice off the stem of the squash and place the squash cut side down on a cutting board. With a chef’s knife, carefully slice through the squash lengthwise to create two long halves. Scoop out the seeds and guts with an ice cream scoop. Brush some olive oil onto the squash and sprinkle with salt and pepper. Place squash halves cut side down on the baking sheet and roast for 30-50 minutes, depending on how large your squash is. 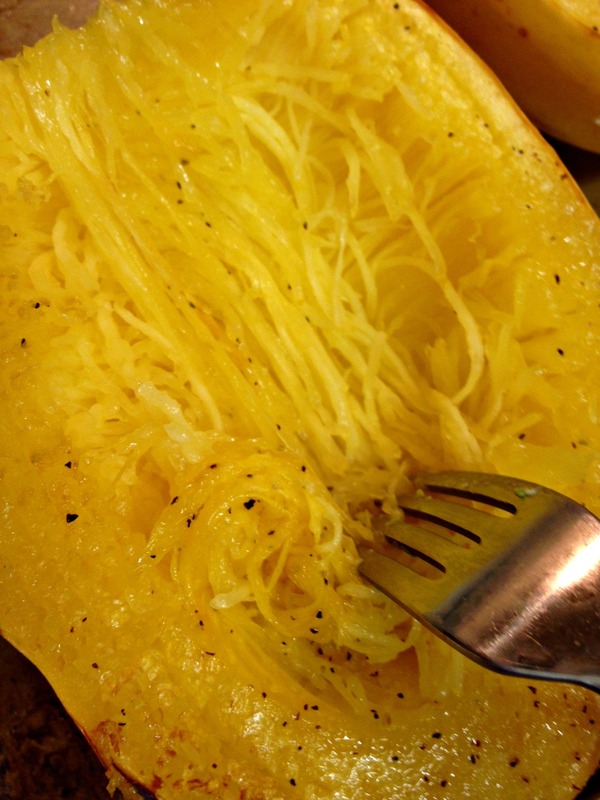 When the squash is tender and you can easily scrape the strands with a fork, it’s ready. I like to check the squash after 25-30 minutes to make sure I’m not over cooking it. Be sure not to cook for too long or it will turn mushy. Step 2: While the squash is roasting, prepare the black bean guacamole. Mash the avocado flesh in a large bowl. 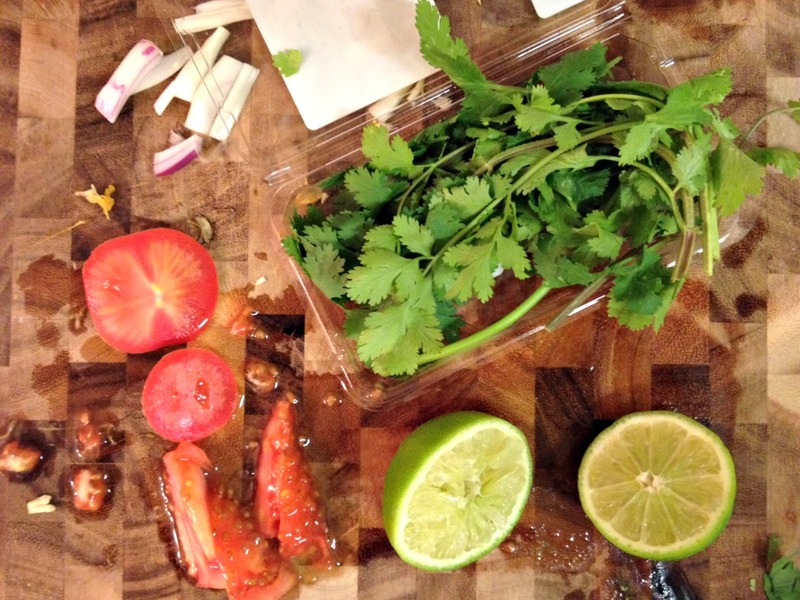 Fold in the onion, tomato, drained and rinsed black beans, and cilantro. Season to taste with lime juice, salt, pepper, and red pepper flakes. Step 3: Remove squash from the oven, flip over, and scrape the flesh with a fork in vertical motions. Do this until you’ve scraped all the strands off the skin. Now sprinkle on some chili powder, cumin, oregano, salt, and pepper (as much or as little as you want). Top the squash with guacamole and serve warm. 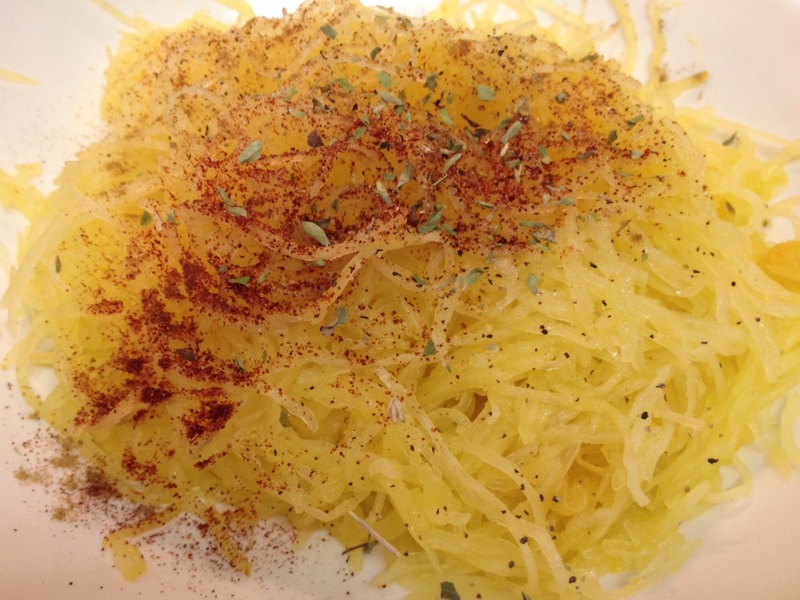 You can also plate the spaghetti squash, if preferred. Besides how yummy it is, I also love that it can be done with regular cheese, Daiya cheese for a vegan recipe or with no cheese at all because it’s Just. That. Good. I didn’t do step-by-step photos, but you can find some great ones at Oh She Glows, where I originally found the recipe. Guys, I just can’t recommend this enough. Seriously, I’m texting my best friend right now that it’s also good just as a side dish. 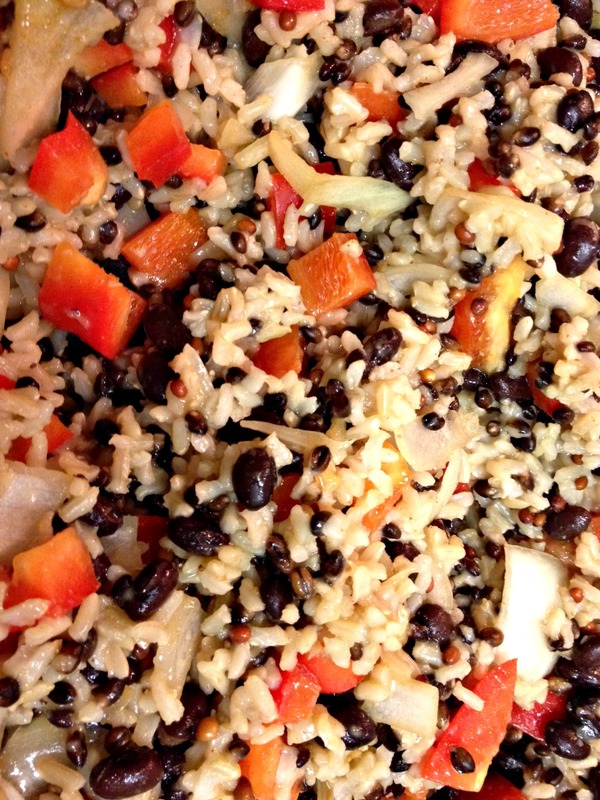 I’ve included the recipe as I originally found it, but when I cooked it, I changed it up a bit by doing 1 cup of wild rice (instead of a half cup of short-grain brown rice). It gets pretty rice heavy, but it’s worth it. I stirred in some cheddar cheese and then served it with avocado. Step 1: Preheat oven to 425F and line a large glass dish with tinfoil. Drizzle olive oil on squash and give a shake of salt and pepper. Coat with hands. Roast chopped butternut squash for 45 mins. or until tender. Step 3: In a large skillet over medium-low heat, add oil, onion, and minced garlic. Sautee for about 5 minutes, stirring frequently. Now add in salt and seasonings and stir well. Step 4: Add chopped red pepper, black beans, and cooked rice and sauté for another 10 mins. on low. Step 5: When b’nut squash is tender remove from oven and cool slightly. Add 1.5 cups of the cooked butternut squash to the skillet and stir well. You can mash the squash with a fork if some pieces are too large. Add Daiya cheese and heat another couple minutes. Step 6: Add bean filling to tortilla along with desired toppings. Wrap and serve. Leftover filling can be reheated the next day for lunch in a wrap or as a salad topper.